I’ve got to know Matthew’s work browsing one of real estate agent’s Instagram account. He caught my attention when I saw his post educating his followers on consequences when some agents just let go and take their photos themselves. It made me think what quality marketing means and how it changes everything. He’s one of the best listing photographers in GTA working with big agents. And he was very open to my idea of talking about real estate photography and… a bit about staging. what is the best time of the day to take listing photos? do all the lights have to be switched on during photoshoot and what to watch out in terms of light? what is HDR photography and is it better than Flash photography? how can you tell if the photographer you’re hiring is really good? what is video production and why would you use it? how did he start and how he marketed his business? do you need photos that are shot with wide angle lens? who manages his social media and which channel is the biggest hit? what he thinks about running a real estate business? what’s the difference between European and American real estate photography? is low commission a good marketing idea? O: I believe good pics, good listing photos, get the buyers into the door. I remember when I was selling my own house, we really put some effort in and got good pictures, and it really paid off. So, I just felt it’s a good subject to talk about and will bring good content hopefully. That’s the context, I basically want to talk about your photography. So first of all, can you just give me a bit of your background or a quick introduction? When did you first become a real estate photographer? How did it all start? M: Sure. I’ve done photography since I was pretty much in high school. It was something I always loved to do, just taking pictures in general. And when I was in high school, I did architecting up until grade 12 and I kind of dropped it to get into something else. So interior architecture and photography used to be something I felt was my passion. But when responsibilities come along, I looked at what’s a good paying job and kind of went into that avenue. I got back into the photography about 3 years ago and really tried focusing on providing really good, high quality photos, that showcase the property better than some other companies out there. What I found was as long as I stuck to my beliefs, my work eventually would shine and stand out from some of the other every day photographers. In a way, yes, you have to compensate for the time and cost to do that. So we are a little bit more expensive, but you get high value. M: For me it’s not a job, it’s a passion! O: Same with me! It constantly gives me that thrill, so I think we both do something that is our passion. That’s the way to be good at it, I believe. M: Yes, yes! Well, for me it’s this: I can go to a house and there’s a certain moment when you walk into the house and you see the paint colors and the furniture, staging and you just know you’re going to kill it. It’s going to look awesome. And there’s other times you walk into house and the staging is not done or there’s a paint that doesn’t work at all – it doesn’t give me that feeling of showcasing my work properly. So, staging, beside paint color, lets our photography shine a lot better. I think paint color is pretty important and getting the right furniture, and right size of the furniture as well. Sometimes oversized furniture doesn’t go well in certain homes. O: Yep, I got it. When I did my research, I actually looked at the listing photos and it just struck me so much that those listings look very much the same to me. I didn’t see anything that would stand out – all of them look pretty much the same, which is not what we are trying to achieve here. I believe the property, in order to stand out, has to have that kind of uniqueness and coziness. I agree that good props, good furniture are important, but at the same time it has to look very human. And people often just get rid of personal stuff. It’s good to get rid of photos, but it’s important to make it human. So people can visualize living there. M: It’s hard for people to let go of their furniture in order to bring something else in to really visualize, to see the difference. They are so stuck and they have this personal attachment to what they have or what their style preference is. They don’t realize that you’re really catering so much more to the general public than yourself. If you can get that into their mind, that whatever furniture is coming in, whatever staging is getting done – this might be not their taste, but it’s the taste of what will help sell the house. O: So, getting into the technicalities. What is the best time (if you were to give advice to the sellers) for you to shoot listing photos. Is there a certain time or you can basically shoot anytime and you can still make it look good? M: The best time to photograph the house is either early morning or later afternoon. However all it means is that if I don’t have that option (because around 1 o’clock the sun coming to the house is the hottest and the brightest) we just have to use a little bit more power in our lights. We have to do more work in Photoshop and make sure everything blends well. When I have clients that come and say “I want you to do the photography for the property”, first thing I want to see is the address and which grade is the sun shining on the face on the house, because you don’t want shoot the front of the house with the sun behind it. You want to always shoot so that the sun is shining on the front of the house and you get the nice blue sky. Sometimes it means that it’s later in the day, because the house face west, east, whatever it is. But the first thing I would generally start with is which way the house is facing then we’ll kind of go around that time to get the front to look the best. Interior wise, if you have a certain room that has really big windows, in the morning with the sun in the front, the back would be very dark. But if you took that shoot with the sun in the back streaming through the windows, it makes a really, really big difference on the actual picture. You get the feel of just wanting to be in that room. So if you have a really big beautiful windows and you have a room that has high ceilings or whatever the case is, try to shoot that one when the sun is shining in. That looks the best. O: And when you go on a photoshoot, do you go alone or do you have someone that helps you with light, for instance? M: It depends on the property. For “every day”, smaller size, most of the time, it’s just one photographer that goes in. I say we because we have a team of couple of people. When we do big luxury homes I bring my assistant with me and we’re able to spend more time on capturing the property, creating images. One of my things is I like to create an image, I don’t like to just photograph a room. I mean, we might have to put a certain light in a certain area to direct sunlight coming into the room. Or to show off really dark wood cabinets we will have to try to change the mood and the feel. So, if the photographer has that passion, he creates an image, not just takes an image. O: Is it a standard thing that all the lights in the house have to be on when you take photos? M: That’s a great question. Actually the perception is, and this is from real estate agents as well, to turn on all the lights, because they want it to be bright. People feel that it’s too dark. When you use a photographer that doesn’t use flash photography, yes, you’ll have to turn all the lights on, because that photographers uses what we call HDR photography. They take a blend of dark, middle and overexposed photos and they blend the three of them together and they get their image. However, with the HDR photo, you don’t get the true color of furniture, for example. Or you might see a lot of blue color cast coming in through the window shining up to the floor, or you see a lot of blue carpet. The paint color on the wall will not be true. And also talking about light fixtures: when you see a bulb, you don’t think about the color texture, but there’s a certain color temperature on every light bulb. So you want to make sure, if you have LED lights or halogen light bulbs, that color temperature matches throughout the house. When you take pictures with lights on (ideally I prefer them with lights off and I light up the room myself), it does sometimes give a nice ambience feeling to it, depending on the light fixture. But you just have to make sure the color temperature of lights is the same, because it won’t match the temperature of our flashes. For example, fluorescent has a totally different light temperature and looks more green in pictures, and other lights show more yellow or orange. You want to try to be uniform. Say, you have two table lamps on the bed with fixture above – you want all those three to look the same. O: I noticed that it’s becoming very popular right now, especially for luxurious, high end properties to get videos or a compilation of photos in the video form. Can you tell me more about that? M: You need to do pictures, because you need them for MLS. The video is more to capture other audiences on YouTube or social media. Our systematic video is a more invading type of video. We have a camera on a dipole and we walk around, create a mood, kind of like in a Hollywood movie. We are going through the house or round a table or a light fixture and we start blending those together in our video production. We start creating a story. Usually we put the music first and we start cutting the video based on the music beat that kind of goes with the theme of the house. You have words or certain branding that gets involved with that. So it’s something that people will stay on and watch longer, because they want to see the whole house. The biggest thing is you do see more of the house, because the camera is moving around. You get more covered, the real effect of whole property, because the camera is going around in different areas. You can use pretty cool effects too: certain things in slow motion, certain things will go from high up down. We also have a drone – we will start from outside, we go around the house’s property. Bottom line is, we just want to create a story. O: How would you plan for a photoshoot when get a call from real estate agent? Do you have to go there before the photoshoot or you just go and get a sense of it on the spot? Or is there a special preparation? M: There are two kinds of photoshoots, or rather, properties. There are certain properties that are very general, very “every day”. You’re going to go in and you’re pretty much able to shoot it. Usually of the size of 2600 square feet and down. When I get a listing order on a luxury one and the address of course – I google it, get to view it on google maps, to see what the outside of the house looks like. I get a general sense of the size of the property or general sense of the look and feel. Sometimes you might have a 2400 sq. feet house, but owners spent 100k extra on the inside. So it’s going to show much nicer on the inside than it does on the outside. Generally my clients that I work with already tell me ahead of time “the house is very well done, is upgraded, has extras”. So I go from there, as far as what to bring. But when I do big luxury homes I definitely try to see property before, if they don’t have already something online that I can see from picture. O: What would you say was your biggest challenge so far? Did you have any strange assignment that would be challenging for you? M: In terms of homes? Taking pictures you mean? M: That happens often. There’s times that you go into a certain home and it’s very dark. And when I say dark, I mean dark painted walls, very dark brown furniture, wall panels. So that makes it kind of difficult, because you’re reflecting a lot of darkness. So you need to bring a little bit extra light to make that work. Dark purples, dark browns, dark greys – those are usually harder rooms to shoot. They don’t look as appealing. Even if you light them up, it still feels very dark. O: And I see it all the time: beige, dark colors. Canadians love to feel cozy and like to surround with darker colors, which might look cozy in the right context. But often when you put very heavy furniture, dark furniture it’s just a bit too much, I believe. M: Yes! But with every challenge comes knowledge. Every time you run into something, you learn something. O: Yeah, I have the same approach. Is there anything different about real estate photography and text book photography, like regular portraits, for instance? In terms of technicalities? M: Oh yes. There’s a small group of people, about 10 of us in our area, Ontario. I know about 10 fellows that really take pride of their work, they use “flash photography”, they create an image, they make sure that shadows are going into the right direction, they want to make sure that it’s flashing in certain areas. There’s a lot of general photographers, like someone that picks up a camera and thinks he’d like to go out and shoot interior photography thinking “because I have a camera with wide angle lenses”, but they don’t know the technicalities that’s behind it. I’m going to go back to HDR (High Dynamic Range). It’s generally about 80% of what you see on the real estate market out there right now. Real estate agents don’t understand the difference, they really don’t. And I think most of them don’t care. But the ones that do care, see the big difference. Usually I like to show before and afters. And it happened to me that someone called me and said “We have photography done but the client doesn’t like it. Can you come in and redo the pictures?” So I go in and redo the pictures and you can see the difference, because the light makes a difference between what the HDR is and what the flash photography does. So generally, if you get pictures done, whether it’s through us or anybody else, I would say: look at the portfolio. Take look at how they handle certain images and you can tell right away whether they use flash or HDR. HDR is generally cheaper, it’s faster, and they promote it as better, but it’s not. O: I have a question, and I want to hear your opinion. I look at a lot of listing photos from European brokers. I love German, Swedish, Scandinavian interiors. Most of the time they are very well styled and this is done for their brokers. And I can also see the difference in their real estate photography. It seems to me they don’t really use that wide angle lens to make the room appear bigger. O: They focus on details, they don’t really just show the whole room. They will show only part of the room, then the other part. They just don’t use that wide angle lens to see the whole room at once. What’s your opinion on that? Does it help over here, is it popular and that’s why it’s used? M: Remember, I mentioned that small group of 10 photographers that shoot a certain style? Wide is not always the best. What’s expected for real estate agents is the room to look as big as possible. It needs to be as wide as possible and they don’t know better, they just don’t have that understanding. I can shoot the room and change lenses. I have wide angle lenses, telescopic, something that is focused. And we’ll start with wide angle shot. And then we tighten that composition, so that we don’t have to show the whole room. We can show the part of the dining room (dining room table) and we can show the part of the living room. So you can do like a cut right through the middle. And when you do that, you get closer to the details, you get better feel, like you can actually engage into the picture a little bit more. And it’s also more proportionate. Things are wider stretched. O: I just think that sometimes showing the details of the property might get that kind of attention from the potential buyer. Because they like to see the details, I believe. It shows better. It stops them from browsing other listings. M: There are few ways. People aren’t looking at the furniture, they’re looking at the house. Others want to see the size of the room, so they get the general sense of how the furniture can fit in. I believe, as a photographer, in capturing your attention. I need you to stop scrolling through your computer and get focused on the picture and get drawn in. And once I can do that, I can show you the other parts of the house that I was able to capture. And that’s going to be with the furniture, the staging, things you can change. O: I meant like entry doors for example – these are things that would not change, these are not movable parts of the house, like furniture. People like to take a look at the details, especially when the house is upgraded or new and it’s worth showing. I believe that might interest them. M: Yes. But generally though, when real estate agent hires you to take pictures, usually it’s for photographing the whole room, for the whole property at the same time. When we shoot luxury homes, or homes that have a lot of details we can then focus, for an additional cost, on the details, like wall panels, light fixtures, front door entrance, whatever the case would be. We include that anyway when we do luxury homes. But for an everyday homes it’s not even required and agents don’t really want to pay for that. But I agree, it does help draw in certain people or keep them looking at the pictures. Because they see this and it breaks it up. O: From my experience, when I speak to homeowners, who I mainly deal with, it’s very obvious that listing time is usually very stressful moment for most of the people. Some people don’t really show it, but most of the time they are very stressed. Do you think any interpersonal skills help? Do you really deal with realtors more or do you meet with homeowners as well? M: It depends. Most of the time homeowners aren’t there, it’s usually the agent. However, when the homeowners are there, we treat home owners as if they are our clients. Because they are my clients. So when I’m there shooting and the homeowner is there, he might have questions and he wants to see what’s going on. O: What would you consider, in your industry – listing photography – not ethical? What would be a total “no-no”? Where I’m going with this, is just for realtors to realize when they look for a photographer, what should they be aware of? What would be like an alert for them or a red light when they deal with the photographer? M: Usually the agents get referred by someone else to go see a certain photographer. But if you don’t know anything about the photographer, I would say do your research. Ask them if they have a website, do they have a portfolio. Here’s one of red flags: sometimes certain photographers, trying to get into the business, will post in the portfolio pictures that are not theirs. It’s not pictures that they’ve taken. So they may get perceived like it’s theirs. But what they actually later provide is not the same thing. They don’t have the ability to do it. They’re trying to get the job. Make sure it is their work. I would check the most recent listing photos of homes that they’ve done. And it goes the same for interior designers or kitchen manufacturers. You want to be diligent and make sure that the company is actually producing the images that they’re showing you or they may have on their web. I’ve just been through this 4 month ago. I got on the site of this photographer in Boston and he uploaded my images as his. It does happen. I contacted him and told him to take it down. He blamed his website developer. I think it’s a really bad excuse. You want your website be seen as ethical, professional and you should automatically show your pictures, otherwise you shouldn’t be using them. So that would be a red flag. Make sure the pictures that are being shown to you are actually from that photographer. O: Are there any trends in listing photography, other than HDR? M: The cinematic video. Lifestyle video is actually emerging here in Canada. It’s really popular in California, and on the West end, like Vancouver. The agents there spend a bit more money on marketing and video and photography production. So you’re getting a totally different level of presentation. O: Imagine you’re in front of the realtors reading this article, is there anything you particularly want to tell them? Any eye opener? M: Want me to sell myself? (laughs)I’ve been an honest and truthful person. I’m not Donald Trump (laughs). I say it the way it is. O: What I mean, do you have any mission statement, you want to tell the realtors’ industry? M: Yeah. As a realtor, you have a business. And your business is to get more clients to be able to sell more homes or get more buyers. You have to operate the realty business as any other business. If you’re producing marketing material that are below what the competition is producing, and you go to the same meeting with the homeowner and the homeowner is looking at their material, their portfolio, how they present their homes and they compare from one agent to another – if you don’t stand out, you will not get the job. You will not get the house. So my advice for agents is: make sure you’re producing the best quality marketing material. Obviously customer service has to be there. But marketing material has to be better than what your competition is doing. Otherwise you’re not going to get the work. One of the things I tell agents: you either pay now or pay later. 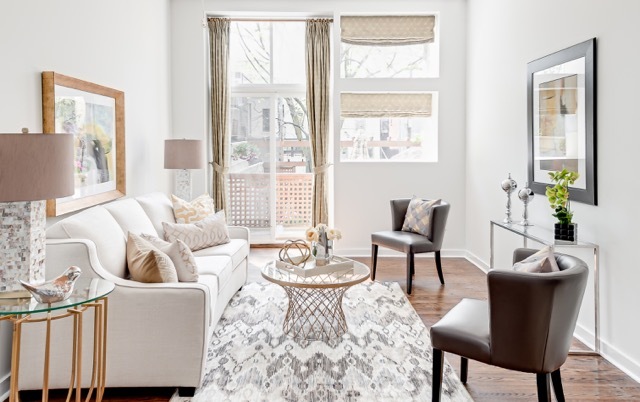 Because if you go cheap and poor quality, staging isn’t done well, photos aren’t done well, it’s going to be very difficult for you to get clients when competing against agents that are spending more money on the staging, photography, and marketing. So, treat it as a business, don’t go cheap to the point that you’re not spending the money just because you just don’t want to spend the money. Look at it as a future business, future investment. O: When you first started doing that, where and how did you advertise? Where did you get the clients? Did you go to any trade shows? Did you advertise in the newspapers? How did you get to your audience? M: I didn’t do any print advertising. When I first started I had couple of agents. I said “If you give me an opportunity I will shoot a couple of your properties, no charge”. Take a look at my work and if you like my work, then you want to continue doing business. I’ll make the investment into shooting it for you just to prove how what I do is different. And from that point on, I gained a customer and gained another customer and so on. And it became a real business. O: So basically “mouth-to-mouth” marketing. People were recommending you to others, right? M: Yeah. When I started doing it, I got on Instagram and posted a lot of my work. And also trying to educate stagers, realtors, and the general public that this is the type of photography that you want to look for or you probably might get from your realtor if you hire one. And certain pictures started to get certain attention. And then you start getting more followers, more calls. Couple of my pictures started going viral. And then things really started to develop, I started getting more audience, more referrals. One of the things that makes me stand out the most are my quality shots, and that was one of the things that took my business to the next level. I was able to produce an image that always made people stop and look. So for me Instagram was pretty much 90% of my marketing. I used Twitter as on-suite but for me it was always Instagram and from Instagram came bigger clientele and social media feed. I started posting my work and have 18k followers now, which is great. My goal is to reach 25k by the end of the year if possible. The thing I didn’t know, was that Pinterest was the biggest source of my audience. And I don’t market on Pinterest, but other people were reposting, pinning my photos on my posts. So I found this a few weeks ago, through my website that my audience is coming from there. O: Do you use someone to manage your social media or do you do it yourself? M: You’re looking at him (laughs), I do it all! O: What are your thoughts on home staging? Is it popular, is it something that only makes sense for high end properties? Do you ever go to vacant properties and realtors invest and hire stagers to do home staging? Do you see any trends in GTA where you operate mostly? It seems to me that realtors are aware of home staging and know it helps, but they leave it up to homeowners to deal with. M: You have to remember this. Real estate agent are treating it as a business and it’s very competitive market right now. Agents are fighting to get work. Some of them are undercutting their commission in order to get property. But when you start undercutting your commission, you’re also going to start undercutting what you’re going to give. So if you’re paying a real estate agent, say 5%, what he is giving you is staging, top end photography, video, whatever it is. If you’re hiring an agent that only takes 2%, you’re not going to get those benefits. So if a realtor is saying “you don’t want to pay this %, so I can’t provide you with staging or photography. So if you want to do it, here’s the cost, but I will only market your house the way it is.” Which is bad, because as I always say, if you give value (whether it’s staging or good photography, anything general in life) people respect the value you’re providing. They won’t try to discount you, won’t try to give less. You’re trying to give more and make it last. They will respect your work, they will respect what you do. And it turns out people call for that same service and they are back. If you said to me “I want you to go and shoot this property but give me a quote for $100 less, or I’ll get another photographer to do it.” Why in my mind would I produce the same quality for less money, and really give you my all? I would rather say “thank you very much, but I don’t want the business”. Because again, I don’t want my work to be seen different. By the same measure, consider staging and if your agent is providing it that’s even better. Sometimes even, it may be just minor things, because you already have nice furniture. It just might be reorganizing it, might be a nice paint wall color change, certain lamp fixture. Sometimes it’s the little details that make such a big difference! O: What’s the difference between Scandinavian and American photography? M: I have a photographer friend from Norway. We have a real estate photography forum, where we discuss tips and tricks and help each other out. Our team’s called “Did it work”. Lighting in Scandinavia, for some reason, is so much better than here. Yes, their photography is more about the composition and it is about painting it white. O: I can’t really express it with words, I just know there is a difference and it’s hard for me to grasp it with words. M: Yes, it’s the right composition. There’s a way of looking at the room. It doesn’t have to be wide, but I can give you enough information to know there’s still more on the left side and there’s still more on the right side. I can cut the half of the couch off or half of the end table and I don’t have to have it all, I can make your mind know there’s more. O: I believe leaving that negative space brings more harmony also. Because if it’s too busy, your eye is going crazy, right? O: Awesome! Thank you so much for this! M: No problem! Nice meeting you! All photos by Stallone Media. You can find Matthew and his work here. Questions? Comments? Your tips on marketing your real estate business? Share with us please! far? I surprised with the analysis you made to make this actual post amazing. give a quick shout out and say I genuinely enjoy reading your articles. These are exactly a few ideas nevertheless the choice really is endless. Kim has 392 fans and keeps them well entertained and equipped.